My friend pointed out to me that this will be my 100th post for 2010. That's just amazing to me. I first read the magazine Artful Blogging in 2008 thought it was quite interesting what people were creating. I never thought I would be one of those people, but with encouragement from my friend Linda and my husband, I'm in my 3rd year of blogging and getting ready to create another blog for my reading interests. By now you all know I love a good challenge and Linda has found a reading challenge that I am going to participate in with my new blog. If you are readers or just a little curious when I get my new blog constructed come on over and visit. On to my card for today, I can't seem to get more than one card created before 10 pm each day, lots of general living going on here right now. I took a little bit of liberty with the sketch at Our Creative Corner. They showed 3 circles down the middle, so I'm kind of counting my 2 little red flowers as the top and bottom circle because I needed a touch of red for the color challenge at CCEE Stampers. My pretty flower burst is from a piece of 12 x12 paper from heidi grace designs, but I stamped the bird nest in the middle and paper pieced the eggs. We're all looking for our first robins so we'll know spring is truly here. Supplies: Ivory Card Blank 5" X 6 1/2" Halcraft, Papers: heidi grace designs Day Dream Believer/Floral Double Sided cardstock, purple unknown, Stampin Up-Soft Suede, Stamps: Am. Crafts-Seeds, Stampin Up-Polka Dot Punches, Ink: Stampin Up-Soft Suede, CTMH-Z2108 Brown Bag, Z2160 Twilight, Z2161 Petal, Stampin Up-Sizzix Small Dots texture plate, Stampin Up-Scallop Trim border punch, Scallop Trim corner punch, Prima flowers, My Momento-Bubbles stickers, Bazzill Basics-tiny, tiny brads, pop dots. Congrats on your 100th post! A great card for your celebration! Thanks for joining the OCC Sketch Challenge this week! Congrats and thanks for joining us at the OCCSC this week. Your card is beautiful! How creative!! 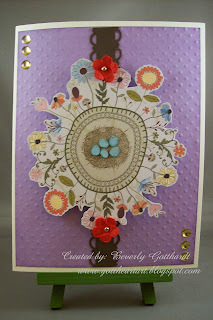 I LOVE your flower framed nest! Congrats on 100 posts too!! Thanks so much for joining us in our CCEE challenge! !